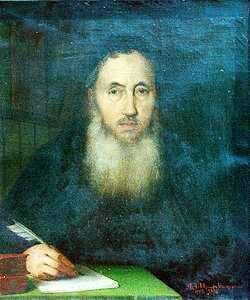 When he founded the Mekhitarist Congregation in 1701, Mekhitar of Sebastia (1676-1749) envisioned a monastic order that would engage in educational activities. Research and scholarship became an integral part of that project, which would be continued by his disciples and successive generations of monks in both branches of the island of San Lazzaro, in Venice, and Vienna. Rev. Mgrdich Avkerian (Jean-Baptiste Aucher, in French) would be one of the remarkable names in the generation that came to the fore after Mekhitar’s disciples. He was born in Ancyra (now Ankara), in Turkey, on November 11, 1762, in a Catholic Armenian family. His younger brother Harutiun (Pascal), also a member of the Congregation, would be famous as the Armenian teacher of Lord Byron. In 1774 their father took young Mgrdich, then twelve, to Venice, where he entered the monastery of San Lazzaro and studied at the monastic school. Upon graduation, in 1786 he was ordained celibate priest. He taught at the monastic school for a decade and then he was sent to Constantinople as a preacher for Catholic Armenians. Back to the monastery after eight years, from 1804 until his death he would hold the positions of adviser for thirty years and of general vicar for twenty years. Rev. Mgrdich Avkerian was also an extremely prolific scholar, linguist, and translator. He published in twelve thick volumes the monumental Complete Life and Hagiography of the Saints in the Ancient Calendar of the Armenian Church from 1810-1814. This huge work was in Classical Armenian, as well as several religious and moral tracts he published from 1809-1814. However, at least two of the latter, Good Advices (1809) and Medicine of Life, which is Spiritual Medical Book (1810), were written in Modern Armenian, which offers an important resource in the study of the history of the language. Avkerian made an important contribution to classical scholarship, publishing two works that have only reached us through their ancient Armenian translation. The first one was fourth century historian Eusebius of Caesarea’s Chronicon, whose Armenian translation he published along with his Latin translation in 1818. This was a very valuable historical source about the ancient world, sometimes with unique information. The second was a collection of writings by Philo of Alexandria, an important source from the first century A.D. in the development of the philosophical and theological foundations of Christianity (1826). 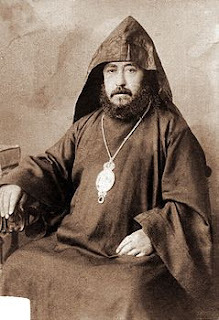 No less important for Armenian scholarship was the publication of eighth-century author Catholicos Hovhannes Odznetsi’s Discourse against Aphtartodocetians (1807). Aphtartodocetism, also known as Julianism, was a heresy rejected by the Armenian Church and formulated by Julian of Halicarnassus, who suggested that Christ’s body was always incorruptible. The Mekhitarist monk also translated a flurry of works from Latin to Classical Armenian—krapar was still the literary language preferred by many—including texts by Seneca, Cicero, and St. Gregory the Great. Particularly important among these translations was the Armenian version of fourteenth century author Hayton the Armenian, Fleur des histories de la terre d’Orient (1842). However, Avkerian’s arguably most celebrated work was the New Dictionary of the Armenian Language, a task that he shared with two colleagues, Rev. Kapriel Avedikian and Khachadour Surmelian. He completed the dictionary from the letter Զ to the end (that is, 30 letters) and supervised the publication in 1836-1837 after the passing of his co-authors. This dictionary, which became the standard source for Classical Armenian to this day, included an enormous amount of entries with corresponding quotations from sources both printed and manuscript. 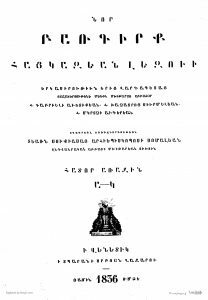 Avkerian was already aware that this dictionary was only available to a limited circle of learned people, and ten years later (1846) he published an abridged version, Pocket Dictionary of the Armenian Language, where he gave the explanations of the Classical Armenian entries in Modern Armenian. Among many Armenian soldiers who served the Russian Empire, the name of Mikhail Loris-Melikov was also relevant for his political labor. His actual name was Mikayel Loris-Melikian. He was the scion of an ancient noble family from Lori, which owned the province in the Middle Ages. They later entered the aristocratic society of Georgia, and the princely family of the Loris-Melikovs was approved in 1832 as part of the Russian nobility. 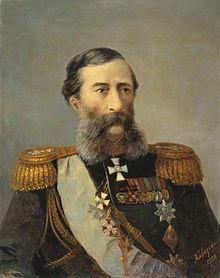 Mikhail Loris-Melikov was born on November 2, 1824, in Tiflis (Georgia), and was educated in St. Petersburg, first at the Lazarian Institute of Oriental Languages and afterwards at the Guards’ Cadet Institute. In 1843 he joined a hussar regiment and was sent to the Caucasus in 1847. He would spend some thirty years there and make a career both as a distinguished cavalry officer and an able administrator, working to ensure a transition from military to civil administration. He was governor of the region of Terek (nowadays the northeastern Caucasus) from 1863-1875. 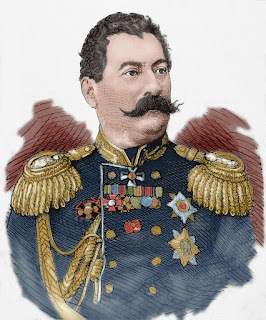 Loris-Melikov, who reached the rank of cavalry general in 1875, commanded an army corps on the Ottoman frontier in Asia Minor during the Russo-Turkish War of 1877-1878. He took the fortress of Ardahan and was rebuffed by Ottoman general Ahmed Muhtar Pasha at Zevin, but he subsequently carried a conclusive victory over his opponent at Alaja, took the impregnable fortress of Kars by storm, and laid siege to Erzerum. His distinguished military service in the war earned him the title of Count, and he was awarded the Order of Saint George of the second degree for his service in Alaja in October 1877. In 1878 Loris-Melikov was transferred to the region of the Lower Volga as temporary governor-general to combat an outbreak of the plague. His effectiveness at the work earned him another transfer, this time to the provinces to Central Russia to combat the terrorist activities of nihilists and anarchists. He was successful in his task, and he was appointed chief of the Supreme Administrative Commission created in St. Petersburg after an assassination attempt against Czar Alexander II in February 1880. He showed his preference for the use of ordinary legal methods rather than exception extralegal measures, believing that the best policy was to strike at the root of the evil. He recommended a scheme of administrative and economic reforms to the Russian emperor with the aim of alleviating the causes of social discontent. Alexander II, who was not convinced of the efficacy of police repression, dissolved the Supreme Commission in August 1880 and appointed Count Loris-Melikov Interior Minister with exceptional powers in November. The scheme of reforms was never carried out. On March 13, 1881, the very day that the emperor signed a decree creating several commissions to prepare reforms in various branches of government, he was the victim of a conspiracy by nihilist terrorists. His son and successor Alexander III adopted an anti-reformist policy and started to undo the reforms promulgated by his father. This led Loris-Melikov to resign in May and retire from active life. He wrote several historical and political works, living in Germany and then in Nice (France) until his death on December 24, 1888. His remnants were moved to Tiflis and buried in the courtyard of the Armenian monastery of Tiflis.